Google has announced that later this week, it will add several new features to its Maps app for iOS and Android commuters. The update includes live, personalized traffic data, support for ‘mixed-mode’ commutes, real-time bus and train tracking, and integration with Apple Music, Google Play Music, and Spotify. The update will include a dedicated ‘Commute’ tab in the Maps app. After users identify their commute, Google Maps will provide live traffic data about the route. The Android app will also include notifications about delays as they happen so you can adjust your trip. 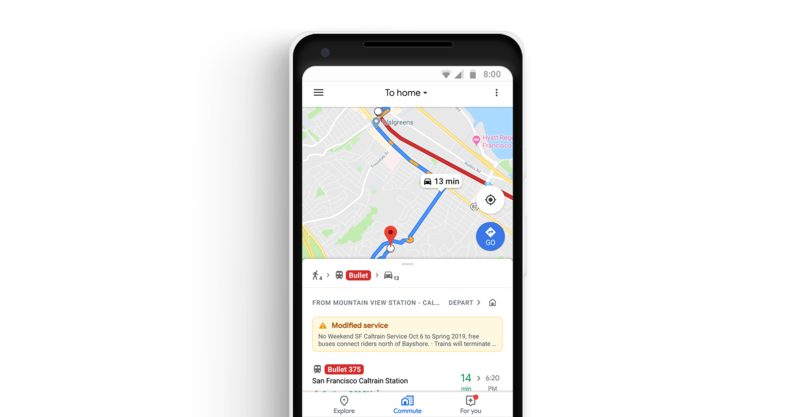 Google Maps will also support mixed-mode commutes. That means, for example, commuters who travel by car, train, and on foot will see commute information relevant to each leg of their journey. Real-time bus and train tracking is being added in 80 cities worldwide too. Playback controls for Apple Music, Spotify, and Google Play Music is coming to Google Maps. Spotify users on Android will also be able to browse and select content from inside the app. As someone who used to commute by train every day, I particularly appreciate the focus on public transportation. Google hasn’t said, but hopefully, these new features are included as part of Google Maps’ CarPlay integration too.